I ordered this from play-asia.com together with Guilty Gear Xrd. Hope I receive it soon. The game was 54 USD, Guilty Gear was 62 USD, shipping was 10 USD, for a total of 126 USD (830 DKK), and today I received an invoice for 345 DKK in import tax (160 DKK of that was fees! ), totalling 990 DKK for two games, 495 DKK per game. This is still cheaper than, say, The Crew as a download at 529 DKK, but damn, that's a lot of money. Got it! Looking forward to playing it. I played through the two first stages of Adventure Mode. It's fun and not too hard to figure out, even though everything is in japanese. According to GameFAQs, there are 10 Episodes in Adventure Mode. Completed 3/10 Episodes. It's getting a bit more challenging. 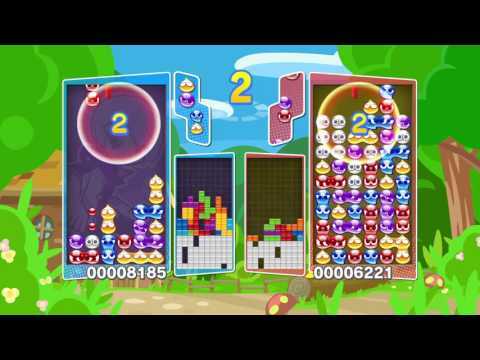 Got the score 1473545 in Puyo Puyo. Trying to improve my Puyo Puyo game, it's pretty tricky to learn to recognize the different types of combos. 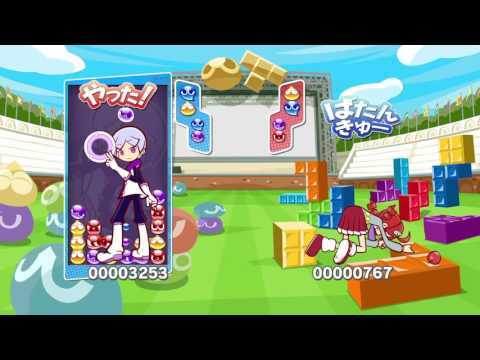 Got the score 2154907 in Puyo Puyo. Got the score 80289 in Tetris Marathon. 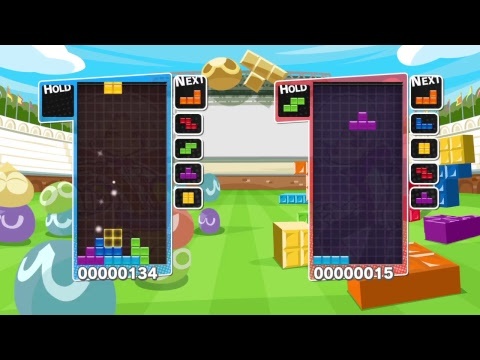 I have reached stage 5-9 in Adventure Mode, which is a brutal Tetris match against a black blobby thing. I'm getting steamrolled every time. And I thought I was pretty good at Tetris. Jonas and Nabaz joined me for some puzzle game insanity. I skipped stage 5-9 (by accident, because I don't understand the menus, and proceeded into episode 6. If you die four times in a row on the same level, you can choose 'Clear the level with help' (おたすけクリアですすむ) to skip the level. completed the game (Adventure Mode). This was over before I expected. But a lot of fun, if a bit stressful. 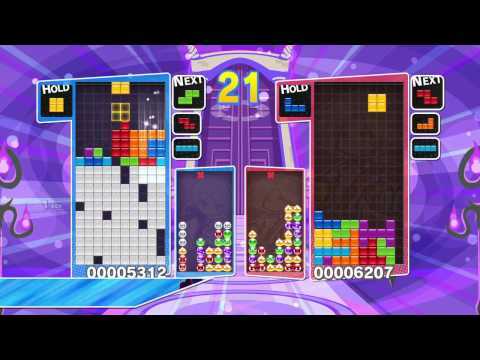 I finally beat the difficult Tetris match 5-9. Bonus episodes 8-10 have appeared in the Adventure Mode! More stuff to play. Completed episode 8 and 9. I'm exhausted. Completed episode 10. I used Kirby's Avalanche to warm up, damn that game is fast! After training, episode 10 wasn't so bad, except maybe for the last Tetris challenge which required total concentration. I had the distinct feeling that Adventure Mode didn't actually get harder, and as I got better myself, the rest of Adventure Mode opened up. 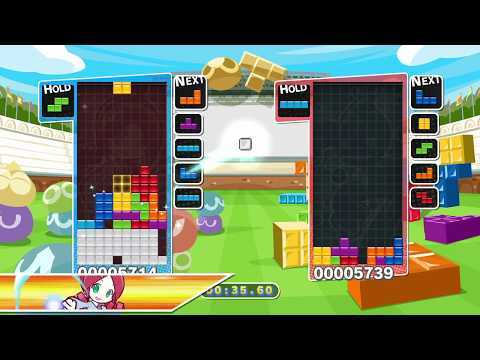 Malu and I played vs. mode, both Tetris, Puyo Puyo, and the mode that switches back and forth. We're fairly evenly matched in both games, which is fun!